Gift of LoveLouis Borachaner is a great and talented baker from Hungary. He is also a great person. I wrote about him many years ago in “The Pie and Pastry Bible” because I heard that when he was pastry chef at the Boulders in Carefree AZ he created the original crème brulée tart that many chefs since were laying claim to. It wasn’t until many years later that I happened into his former bakery in Colorado Springs (“Bread Head”—named by his son.) He recognized me from the photo on my book and introduced himself. It was such a joy finally to meet him. I was delighted to hear from Louis Borachaner again recently when he sent me information about his latest production: The worlds largest chocolate menorah for Hanukah. It stands all of 9 feet tall and surely smells as delicious as it looks against the backdrop of Pike’s Peak and the other snow-capped mountains. 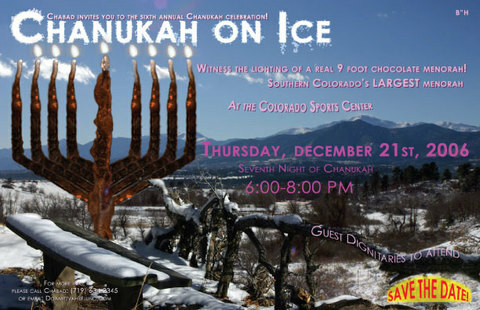 Louis made this as a gift to the Jewish community of Co. Springs. The spirit of this gift touches my heart because it follows a very beautiful tradition of embracing other people’s spiritual beliefs. Did you know that the most powerful Jewish liturgical music, the Kol Nidre, was written by the musician and Protestant minister Max Bruch as a gift to the Jewish community in England? I wrote my book “Rose’s Christmas Cookies,” in this same spirit and was rewarded by it becoming a classic, still beloved by many after 15 years. My editor, at first, doubted the wisdom of my writing it, but admitted later that she had been mistaken. And what was one of the truly most gratifying moments of my professional life was when a reviewer in Rhode Island wrote that the introduction contained the most moving prose on Christmas ever to be written. I still get the chills even as I write this. Happy Holidays Everyone and help keep the love and spirit of this season going all year ‘round.